While I’m plotting the next Tiki Goddess Mystery and making plans for a big booksigning event here on Kauai I’ve been taste testing a new drink (kind of like Uncle Louie in Mai Tai One On). I’m calling it the Gingerita…for lack of a better name. Here’s the recipe. Try it at your own risk…. For a double or a drink to share. Some lime juice to taste. A splash of Margarita mix if desired. Mix all with ice in a cocktail shaker and shake. Pour into margarita or martini glasses rimmed with a combination of sugar and powdered ginger and sip. Any suggestions for a better name? Umbrellas optional for a gingerita! Can anyone think of a better name for the Gingerita? Leave a comment below. Any name for the drink is great as long as it helps you write the next book quickly. I just finished Mai Tai One On and thought it was great! I am so looking forward to reading more books in this series. Not so sure the Gingerita will help me go faster but I am hard at work on Book 2. So glad you enjoyed the read! 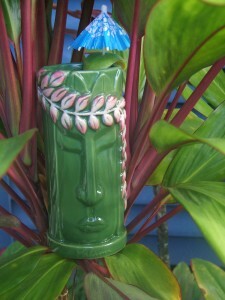 Tiki on! Sounds so good! I bet it tastes even better on the Lanai!